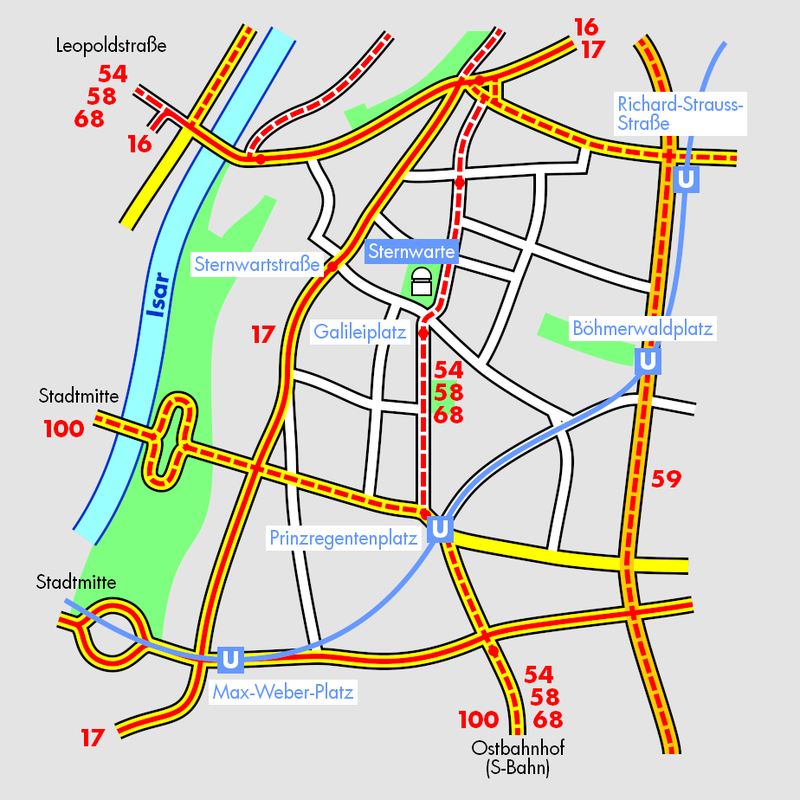 The USM is located at Scheinerstraße 1, in Bogenhausen on the east side of the river Isar. The Munich public transport is run by MVV which has a detailed Journey Planner online. The Munich airport (Franz-Josef-Strauß-Flughafen) is located 24 km to the north-east of Munich between Freising and Erding. The airport is connected to the Munich public transportation net (MVV). At the airport: arriving from any terminal region follow the railway sign or green “S”-sign and enter the S-Bahn S8 in the central area (Z). Exit at Ostbahnhof (= East Station). The S-Bahn leaves every 20 min nearly 24 hours a day and takes about 30 min. At Ostbahnhof take bus 54, exit at Galileiplatz. A one-way ticket costs about 10 Euros (strip ticket, 4 zones = 8 blue strips). Alternatively, there are lots of bus connections, hotel buses, and other airport shuttles. Take one of the S-Bahns to Ostbahnhof, then enter bus 54, exit at Galileiplatz. Take U4 (green line) to Arabellapark, exit at Prinzregentenplatz. Walk the rest along the Possartstraße, or take bus 54 and exit next bus stop (see local map). Take tram 17 (to St. Emmeram), exit at Sternwartstraße (12th stop). tram 16 to Effnerplatz, change to tram 17 at Isartor. Take bus 54 (to Münchner Freiheit) which leaves from the bus terminal in front of the railway station building. The bus stops at Haidenauplatz, Grillparzerstraße, Prinzregentenplatz, and Galileiplatz, where you exit. either: exit at Odeonsplatz; take U4 to Arabellapark and exit at Prinzregentenplatz. From there, walk the rest along the Possartstraße or take bus 54 at Prinzregentenplatz (direction Münchener Freiheit) for one stop (Galileiplatz). or: exit U6 already at Münchner Freiheit and take bus 54 (direction Lorettoplatz); exit at Galileiplatz. E54 (= A96) Lindau (Bodensee). From North (Nürnberg): at Autobahnkreuz München Nord continue south in direction Munich Center – at exit Frankfurter Ring hard right to Föhringer Ring – at Effnerplatz continue ahead – at Herkomerplatz half left to Ismaninger Straße – left to Sternwartstraße. 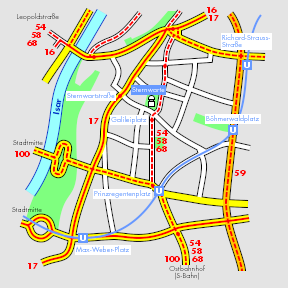 From East (Passau): A94 straight on to the end of the highway – cross the Richard-Strauss-Straße straight to Prinzregentenplatz – right to Possartstraße. From South (Salzburg, Innsbruck): at Autobahnkreuz München Süd follow direction Nürnberg or Airport (A99) – leave at Autobahnkreuz München Ost and continue as coming from East. From West (Stuttgart): leave the A8 at Autobahndreieck München-Eschenried and follow traffic signs to Salzburg – at Autobahnkreuz München Nord continue as coming from North. A9 – exit Frankfurter Ring to Föhringer Ring and continue as coming from North. Hotel Stadt Rosenheim, Orleansplatz 6A, 81667 München (Haidhausen, near Ostbahnhof, 6 minutes direct bus ride on bus 54 to USM), rate standard single room 110 Euros all included. Motel One City Ost, Orleansstr. 87, 81667 München (Haidhausen, near Ostbahnhof/Haidenauplatz, 5 minutes direct bus ride on bus 54 to USM), rate standard single room 80 Euros all included. Hotel Occam, Occamstr. 7, 80802 München (Schwabing, near Münchner Freiheit, 15 minutes direct bus ride on bus 54 to USM), rate standard single room 120 Euros all included. mk hotel münchen, Einsteinstr. 34, 81675 München (Haidhausen, near Max-Weber-Platz, 5 minutes direct ride on tramway 17 to USM), rate standard single room 80 Euros all included. Hotel Adria am Englischen Garten, Liebigstr. 8a, 80538 München (Lehel, 15 minutes from USM, 6 minutes on tramway 16 plus short walk to USM), rate standard single room 110 Euros all included. In case you use a portal such as booking.com to find a hotel, search for district “Haidhausen” or “Bogenhausen” to locate hotels in the vicinity of the USM.